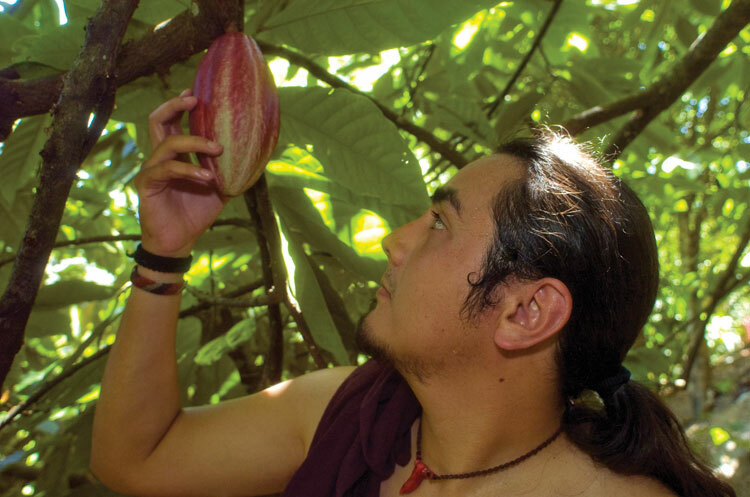 Although not all scientists agree on the origin of the cacao plant, the consensus is that it is a native of the rainforests of Venezuela and the Amazon and was brought to Central America millennia ago by traders. 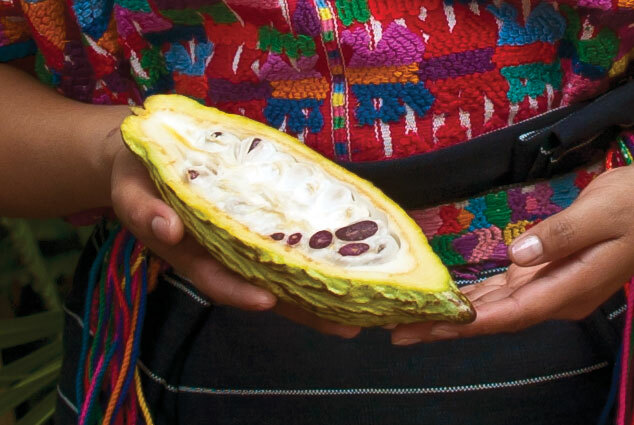 The earliest evidence of human consumption of cacao in Guatemala comes from a site in the northeast section of the country, where a 3,500-year-old pottery vessel tested positive for remnants of theobroma cacao. Exactly how the Olmec were consuming cacao has not been determined, but they might have been mixing it with native wild honey and chili. Sometime around 1,000 B.C. the Maya, whose civilization flourished from the Yucatán Peninsula to the Pacific coast of Guatemala, are believed to have cultivated the cacao tree for the very first time. The Maya so highly valued cacao, they used cocoa beans as currency and to pay taxes. Spanish conquistador Cortez was fascinated by native cocoa-drinking customs. 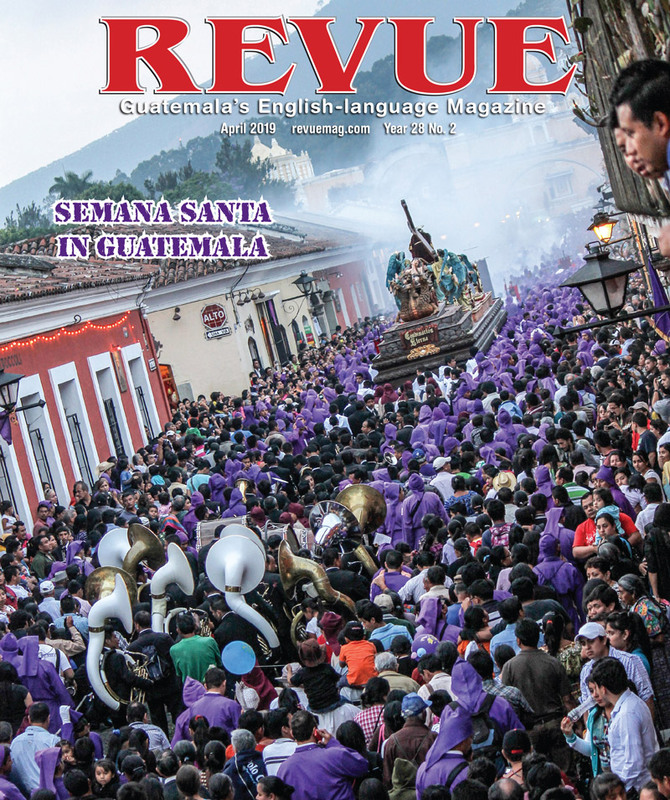 Chronicler Bernal Díaz del Castillo observed that royalty drank cocoa from vessels of gold, and that ground cocoa was kept by the wealthy in gold containers. 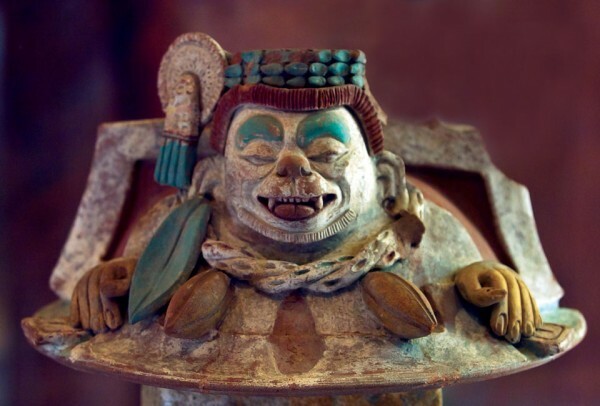 The Aztecs made a drink of finely ground cocoa beans, mixed in water and beaten to a froth with a wooden molinet. They spiced the cocoa with native vanilla and chili peppers, and some added honey to the mix. The name “chocolate” comes from the Nahuatl word atte, which in the Mexican Spanish language means water, and from the sound that the water and cacao blend makes as it is whipped up by the cook: choco, choco, choco, until it is bubbly and rises into a froth. 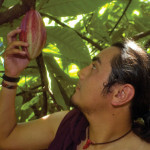 Today cacao is cultivated all over the equatorial tropics, from Vanuatu to West Papua and from Sri Lanka to Sierra Leon. 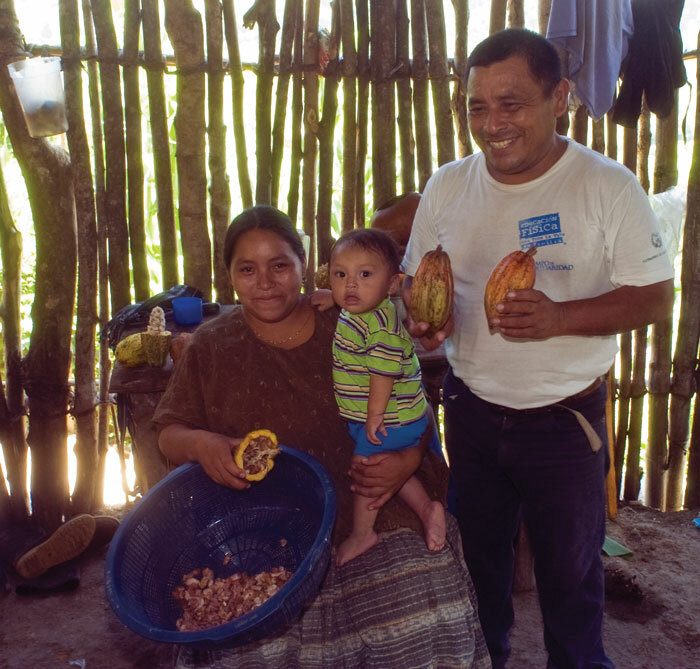 In Guatemala the largest commercial plantations are in Retalhuleu, but the true heartland of cacao remains in the region of Alta Verapaz. 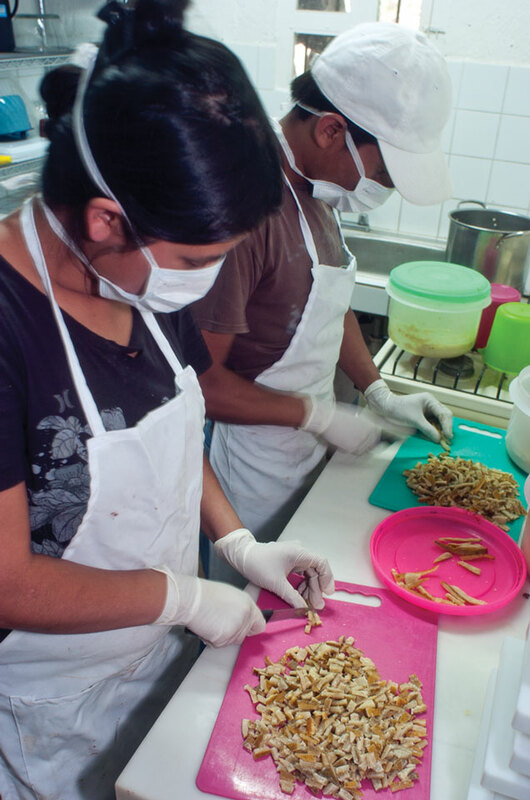 Here hundreds of small, local producers in Lanquín, Cahabón and Chisec continue to produce some of the world’s finest chocolate in much the same manner as did their ancestors thousands of years ago. 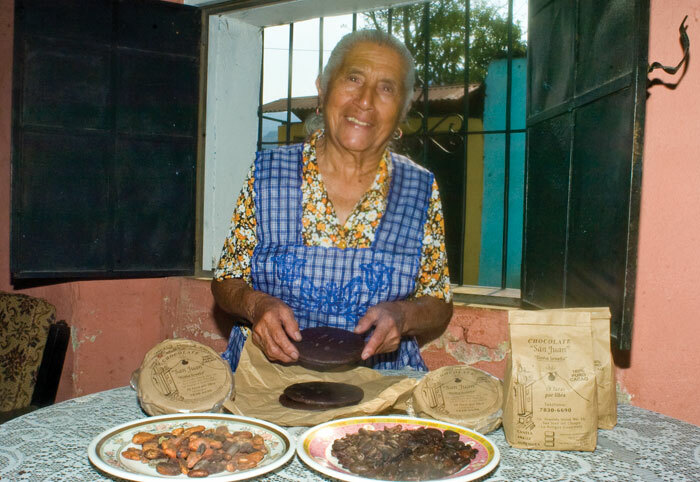 Chocolate has its roots in Guatemala and is the traditional cup offered for hospitality as well as the communal brew distributed at all Mayan sacred and ceremonial events. We can be certain that on Dec. 21 Maya everywhere will be toasting the arrival of the new era with a gourd full of frothy, aromatic, slightly bitter, slightly sweet chocolate. A new study reveals that chocolate produces heart-healthy benefits. The research found that epicatechin, one of a group of chemicals known as flavanols, is directly linked to improved circulation and other hallmarks of cardiovascular health. The discovery was detailed in the Jan. 16 online issue of the Proceedings of the National Academy of Sciences. 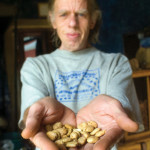 “Although previous studies strongly indicated that some flavanol-rich foods, such as wine, tea and cocoa, can offer cardiovascular health benefits, we have been able to demonstrate a direct relationship between the intake of certain flavanols present in cocoa, their absorption into the circulation and their effects on cardiovascular function in humans,” said biochemist Hagen Schroeter of the University of California, Davis. The study relied on volunteers from the Kuna Indians, who live on the San Blas islands off the coast of Panama. High-blood pressure and other signs of cardiovascular disease are rare among the Kuna. 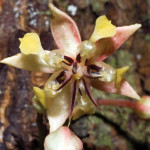 And they are known to consume large amounts of flavanol-rich cocoa—three to four cups a day. 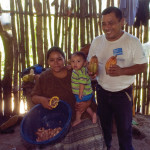 Previous studies found that Kuna who migrated to the suburbs of Panama City on the mainland drink only about four cups of cocoa per week and do not enjoy the same level of cardiovascular health. The islanders have twice the level of urinary nitric oxide, a chemical associated with healthy flow of blood through the arteries. And those who drank cocoa with more flavanols had higher levels of nitric oxide. Also, higher levels of epicatechin in the bloodstream were accompanied by improved blood flow. Lab tests showed that flavanols allow vascular tissue to relax. Finally, tests showed that pure epicatechin had much the same effect as flavanol-rich cocoa. 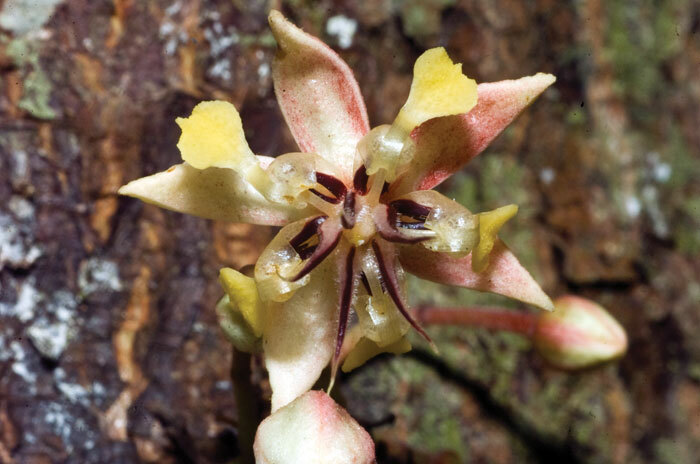 “The results of this study provide direct proof that epicatechin is, at least in part, responsible for the beneficial vascular effects that are observed after the consumption of certain flavanol-rich cocoas,” Schroeter said. 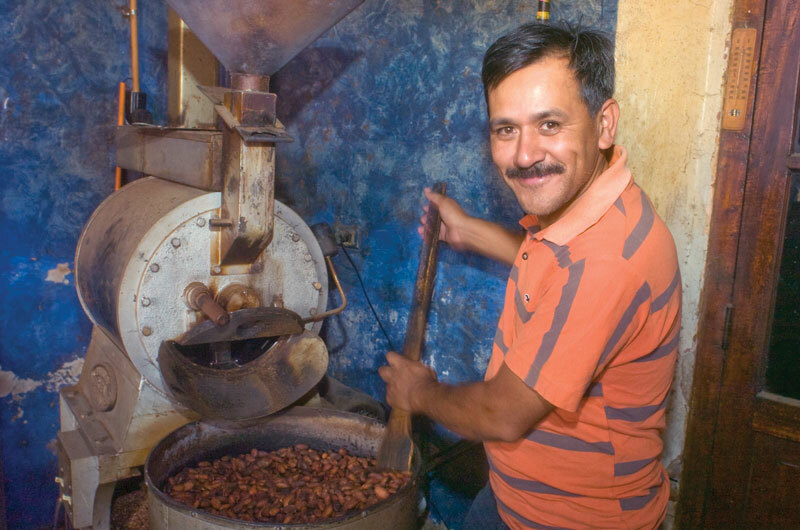 The hub of traditional chocolate production is in the little town of San Juan del Obispo, located just up the hill from La Antigua Guatemala on the slope of volcano Agua. Here numerous small family factories have been producing homemade drinking chocolate for generations. 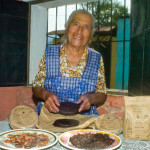 One of the best known local producers is Doña Josefa, who welcomes visitors to her small operation where they can see how cacao beans are selected, toasted, ground and, after being mixed with sugar and a variety of special additives such as cinnamon, almonds or rice, are formed into the round tablets, which are available for purchase all around Antigua. 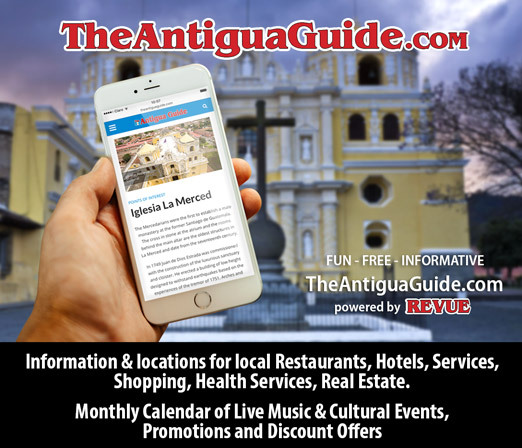 To arrange for a tour of her facilities (Chocolate San Juan, 1a avenida norte #10, San Juan del Obispo), contact Doña Josefa at 7830-6690. For those interested in getting organic, pure and unadulterated chocolate visit Tony Ryals at his shop Tostaduría Antigua on the corner of 7a avenida and 6a calle poniente. Nothing fancy here, just 100 percent pure ingredients produced and packaged on site. Tony offers a variety of rustic chocolate concoctions and features his 50-50 chocolate candy that is made from 50 percent pure roasted cacao mixed with 50 percent pure organic honey. My favorite is Tony’s Cinnamon-Chili Zinger! 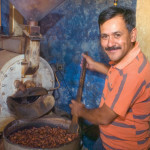 New to Antigua is the Choco Museum on 4a calle oriente #14, next door to Doña Luisa Xicotencatl bakery and cafeteria. 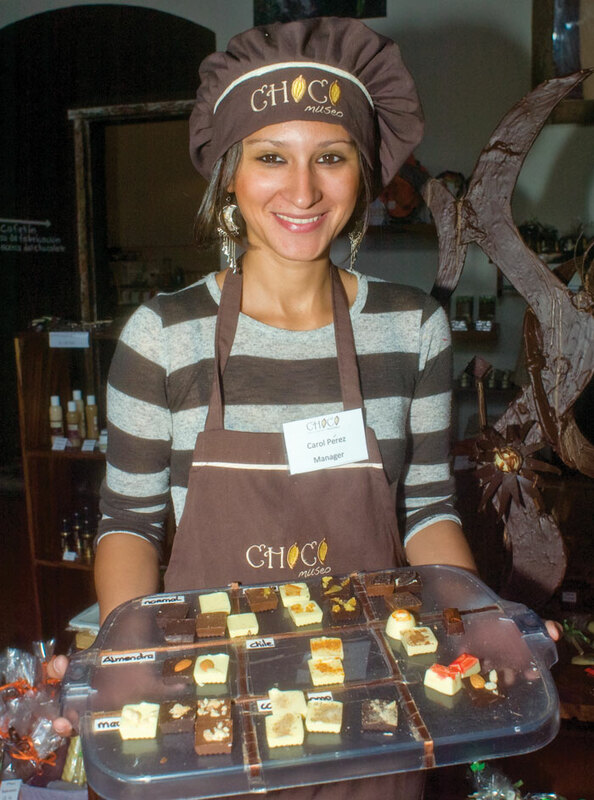 The ChocoMuseo takes visitors through the chocolate process; it also offers workshops where you’ll make your own chocolate, right from the cacao beans! 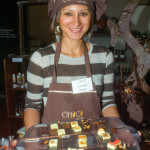 The museum includes installations and displays to educate the public on all things chocolate. It also sells upscale chocolate candies in many flavors and varieties to suit just about every chocolate lover’s craving. And what could be better than to crave something that is actually good for you, too? Well done article. All of the best prophylaxes and CURES are available from naturally occuring plants, minerals, metals and other substances, thereby being abundant and sustainably produced at a reasonable cost. Preventions and remedies used by ancient and indigenous people using naturally occuring substances, such as the Ayurvedas of India, should be brought into systematic universal knowledge, but are widely maligned by the large pharma-chemical corporations and institutions that profit so handsomly from a steady stream of sick people who are seldom made well. Unfortunately, these same institutions are frequently the gatekeepers of mainstream perceptions via the tenacles of corporate mass media, which they also control. But the internet is changing all that, thankfully, with articles like this. Thanks you, Mr. Janson. 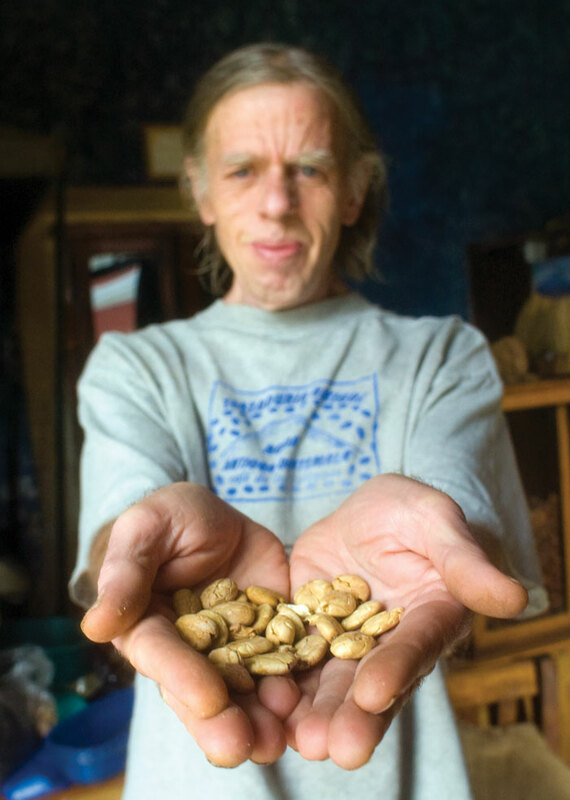 Tropical beans are among the best, with cocoa and coffee being at the forefront. I sure enjoyed reading this article about Chocolate. Thank you.